We have no idea when this picture was taken, but it seems to be during the period, perhaps after the second world war, when old cars were not worth much and were stored in their sad and original state. Two modern images of an almost identical car (possibly the same one) on the internet are variously described as dating from 1927 or 1928, with a supercharged Ruby Type K engine. In fact, a string of images of the same car claim that the car is a racer that belonged at one time to the famous automotive historian and collector Serge Pozzoli, and participated in the Grand Prix de Spa in 1932, driven by Lavillatte et Luys. Perhaps someone can tell us more. 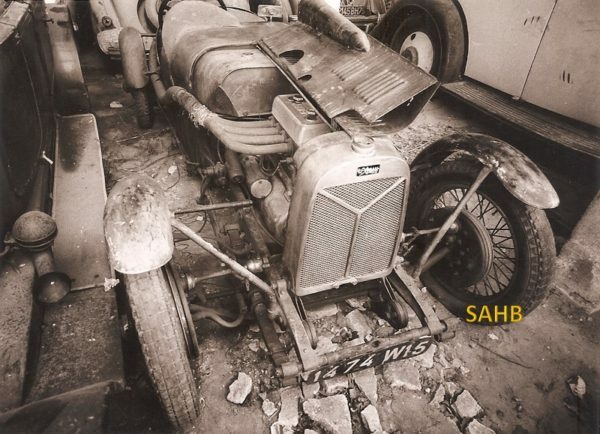 Marquis Raymond Siran de Cavanac started to produce the three-wheeler D’Yrsan in 1923, having left Sandford in a huff after Mme Sandford told him that he couldn’t build as good a car as her husband’s. The new marque, powered by Ruby engines and with independent front suspension by transverse leaves, became one of the three best-known French three-wheelers, alongside Sandford and Darmont. A series of models made good progress up to up to 1927, when Siran realised that customers were losing interest in three-wheelers. He therefore produced his four-wheeler, available with ifs or with the beam front axle we see here, again with Ruby engines, in this case of 972 or 1072cc capacity. Cars were available with lowered or normal frames, and with 2-door coupé or sports bodies. For the 1929 Le Mans race a smaller-capacity 750cc Ruby engine was fitted to bring the car into the lower capacity class. Our picture is almost certainly not of a Le Mans car, because we have a picture of the 1929 racer with a significantly different body. Total production of D’Yrsan cars was only 587, of which 530 were three-wheelers and only 50 four-wheelers, plus 7 special racing versions of the four-wheelers. So our picture is showing a rare beast.